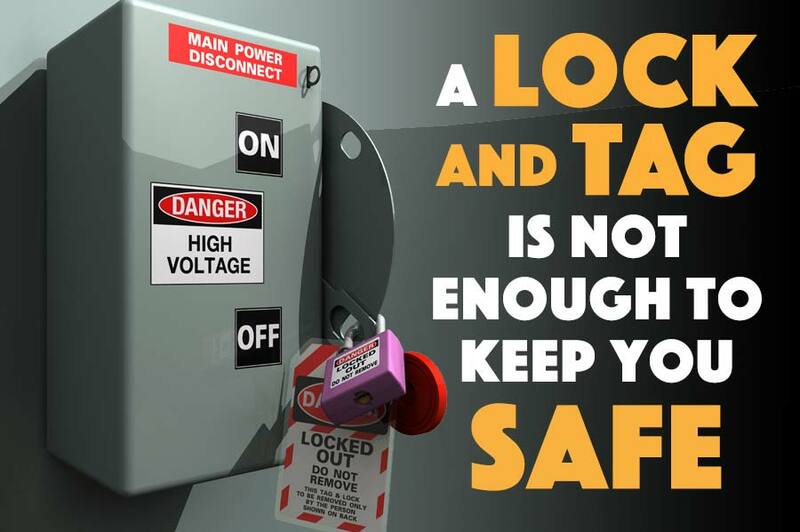 When working on or near electrical equipment, the most effective means to keep workers safe is to open the disconnect switch and then apply a lock and tag. By performing this simple task, we have eliminated any shock, and or, arc flash hazard. Right? Not so fast! A common misconception is that once the disconnect switch is opened and a lock is applied the equipment is “dead” and safe to work on. Accidents where workers think energized circuits are dead claim the lives of electrical workers every day. Disconnect switches fail, circuits are fed from multiple sources, or the wrong switch gets opened, it’s simply not safe to just open the switch, apply a lock and go to work. This why OSHA (29 CFR 1910.333(b) and NFPA 70E (article 120) require that something called an electrically safe condition be established and verified. Creating an electrically safe condition is a six-step process, applying the lock and opening the switch are two of the steps, but before a circuit can truly be considered “dead”, a qualified person must verify the absence of voltage using a proper test instrument. Because the equipment is not considered electrically safe until the verification is made, this verification test must be considered “live” work. This means that personal protective equipment rated for any electrical hazard must be worn. Bureau of Labor Statistics Work Injury Report Study. OSHA’s Office of Mechanical Engineering Safety Standards. Verify all sources of power. Consult an up-to-date one-line drawings or schematics to determine all available sources of electrical energy. Some panels or buses may be feed from alternate sources such as back-up generators or cross-tied to other equipment. Turn-off the equipment using a control switch or interrupting the load current through approved means. Then open the disconnecting means for each source, isolating the equipment to be worked on. Whenever possible, visually verify that all blades of the disconnecting means are physically open or that draw-out type circuit breakers are withdrawn to the fully disconnected position. Install lock-out/tag-out device in accordance with your policy. This ensures the equipment will not be energized inadvertently during the work process. Using an adequately rated test instrument, test each conductor phase-to-phase and phase-to- ground. Verify the meter is operating properly by testing it on a known live source before and after the absence voltage test. conductors or circuit parts before touching them. Electrical equipment is not safe to work on until all six steps above have been completed. A direct contact voltmeter rated for the circuit voltage must be used. Test phase to phase and phase to ground. Verify the meter works properly by testing it on a known live source, before and after the absence of voltage test. This work must be performed by a qualified person. PPE rated for any electrical hazard must be worn.